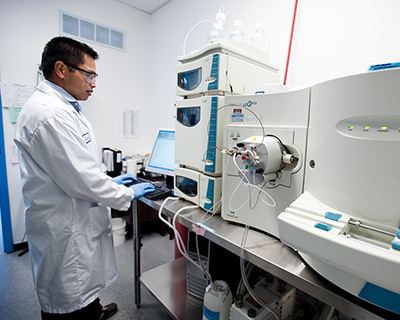 Whether it is for routine analytical release testing or the development of challenging or specialized analytical methods for your large or small molecule, Dalton’s team of highly experienced analytical chemists use up-to-date, compliant laboratory infrastructure to meet your quality standards. By integrating analytical method development and validation services with API and dosage form manufacturing, we reduce turnaround times for your drug development program and achieve key milestones faster. Dalton’s comprehensive analytical services support our integrated services including drug discovery, drug development, process development, contract cGMP API synthesis, and cGMP finished dose manufacturing. Our on-site microbiology services lab is part of our complete analytical service offering. Our Analytical Services area was architecturally designed to house a wide array of analytical equipment. The analytical lab supports the cGMP manufacturing services with analytical method development services, method validations, raw material release testing, in-process testing, finished product release testing as well as stability testing. Dalton utilizes current industry standard equipment including HPLC, GC, LC-MS, SEC-MALS, KF and others to support our customer requirements.